Combining data from NASA's Chandra X-ray Observatory with radio observations and computer simulations, scientists have found a vast wave of hot gas in the Perseus galaxy cluster. Spanning some 200,000 light years, the wave is about twice the size of the Milky Way galaxy. 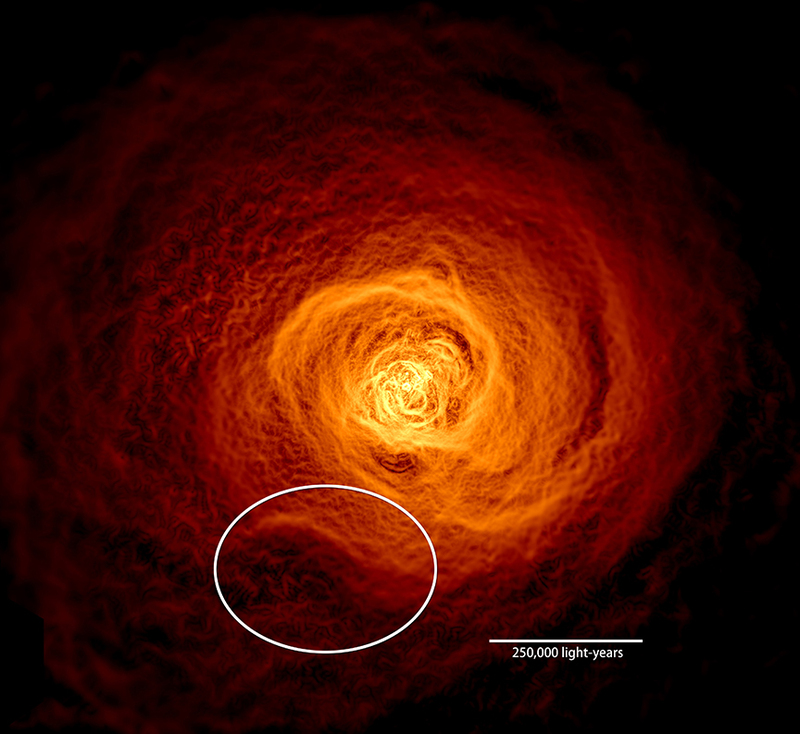 Researchers think the wave formed billions of years ago after a small galaxy cluster grazed Perseus and caused its vast supply of gas to slosh around in an enormous volume of space. Galaxy clusters are the largest structures bound by gravity in the universe today. Some 11 million light years across and located about 240 million light years away, the Perseus galaxy cluster is named after its host constellation. Like all galaxy clusters, most of its observable matter takes the form of a pervasive gas averaging tens of millions of degrees — so hot it only glows in X-rays. Chandra data have revealed a variety of structures in this gas, from vast bubbles blown by the supermassive black hole in the cluster's central galaxy, NGC 1275, to an enigmatic concave feature known as the "bay." To investigate the bay, researchers combined a total of 10.4 days of high-resolution Chandra data with 5.8 days of wide-field observations at energies between 700 and 7,000 electron volts. 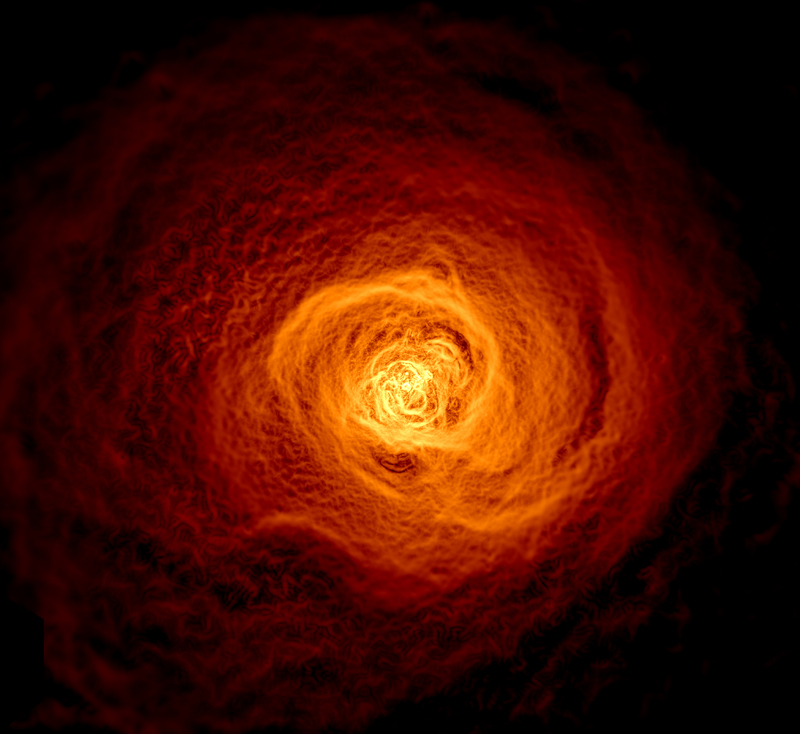 This X-ray image of the hot gas (above) in the Perseus galaxy cluster was made from those observations. Researchers then filtered the data in a way that brightened the contrast of edges in order to make subtle details more obvious. An oval highlights the location of the enormous wave, centered around 7 o'clock, found to be rolling through the gas. Next, the researchers compared the edge-enhanced Perseus image to computer simulations of merging galaxy clusters run on the Pleiades supercomputer at NASA's Ames Research Center. Credit: John ZuHone/Harvard-Smithsonian Center for Astrophysics. One simulation seemed to explain the formation of the bay. This simulation is shown above. In it, gas in a large cluster similar to Perseus has settled into two components: a "cold" central region with temperatures around 54 million degrees Fahrenheit (30 million degrees Celsius) and a surrounding zone where the gas is three times hotter. Then a small galaxy cluster containing about a thousand times the mass of the Milky Way skirts the larger cluster, missing its center by about 650,000 light years. The flyby creates a gravitational disturbance that churns up the gas like cream stirred into coffee, creating an expanding spiral of cold gas. After about 2.5 billion years, when the gas has risen nearly 500,000 light years from the center, vast waves form and roll at its periphery for hundreds of millions of years before dissipating. These waves are giant versions of Kelvin-Helmholtz waves, which show up whenever there's a velocity difference across the interface of two fluids, such as wind blowing over water. They can be found in the ocean, in cloud formations on Earth and other planets, in plasma near Earth, and even on the sun. A paper describing the findings appears in the June 2017 issue of the journal Monthly Notices of the Royal Astronomical Society and is available online. NASA's Marshall Space Flight Center in Huntsville, Alabama, manages the Chandra program for NASA's Science Mission Directorate in Washington. The Smithsonian Astrophysical Observatory in Cambridge, Massachusetts, controls Chandra's science and flight operations. Awesome picture. "Hot gas" is a bit of a misnomer, as the correct term for matter this energetic is plasma. This is a key distinction, as plasma acts very differently than mere hot gas. Nobel Prize winning physicist Hannes Alfven noted this over forty years ago. As to being a wave resulting from some physical agitation, the spiraling form looks rather more like the end-on view of a vast interstellar Birkeland Current. Fascinating. How far are these waves from our own star system, I wonder? Very cool, thank you. Would that wave strip off a planets atmosphere? My son is in his last year of getting his degree in aerospace engineering, both of us really enjoy the unbelievable, incredible pictures and history of our vast universe that you provide to all of us. Thank you thank you... Look forward to seeing and reading more, I am a captain of large vessels in the South Pacific, I spend numerous nights gazing with my binoculars into the dark sky. Thanks for "spraying" your knowledgment. It's a pleasure for me read this stuff. I'm a 64 years mechanical engineer. Science, what amazing process and a way of thinking... it is so incredible and wonderful. Thank you for all these data, videos, pictures, etc. How does the temperature change with time in the wave? What are the most abundant elements? Are any new elements created within the wave? A wave of hot gas in the Perseus Cluster. About 250 million light years away from Earth. X-rays from Chandra, radio observations, and computer simulations. The wave is about 200,000 light years across.